This book is divided into three parts. The first is a trip through dentistry. We start with diagnosis and causal therapy (prevention). We critically assess the options for restoring decayed teeth, and the question of which way to go is debated. Furthermore, we need to understand the role of esthetics as a driving force for restoration. When it comes to replacing teeth, implants have led to completely new routes. However, it should be assessed how successfully they may replace standard therapies, and whether they may become the new standard. 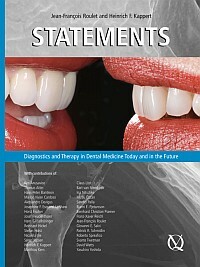 Dentures and orthodontics have also been influenced by the changes not only in technology, but also in perception. In the second part, the focus is on technologies. Very often they are the driving force for future application techniques. The third and final part is a look into the future, seen from a technological stance and from a broader, more generalized perspective.